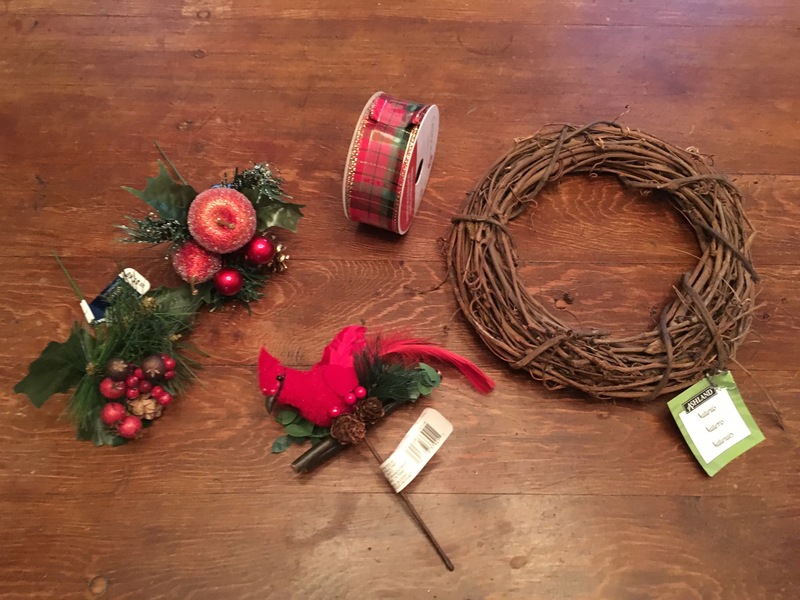 So, I wandered into Michaels to browse their wreath goods, and found a ton of inspiration. 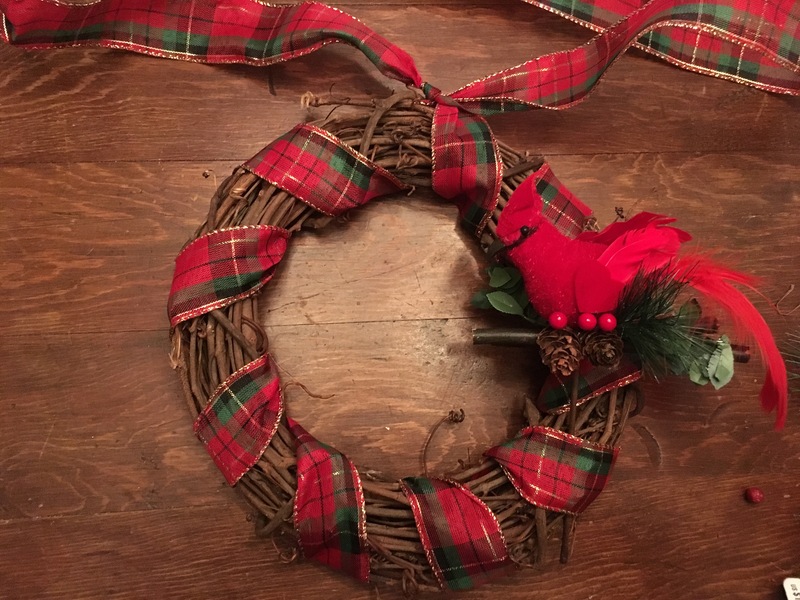 I came up with too many ideas, especially for the front door, so I thought I’d just try making a mini wreath that can be given as a gift, instead. The best part: I had a 40% off coupon that couldn’t be used on the decor pieces because they were on sale. But, grapevine wreaths in the everyday floral dept. (not the Christmas aisle) were regular price — which is pretty inexpensive to begin with, which meant I could use my coups! After all was said and done, after sales and discounts, I only spent about $10. That’s it! I ended up not using the frosted fruit pick, but at just a buck and change, I couldn’t resist grabbing it and I’m sure I’ll find another project for it! 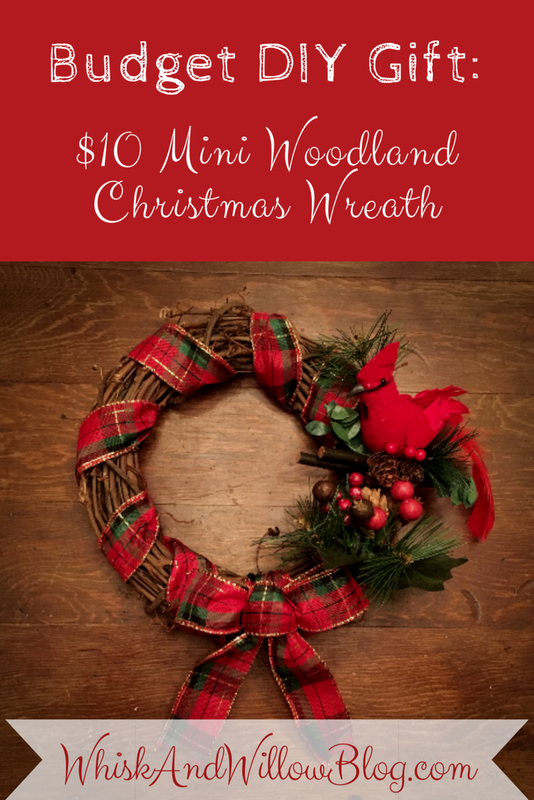 Leaving a long tail, wrap the ribbon around the wreath. Hint: Wired ribbon works best, so that you can maneuver, twist, or pinch it as needed, especially because grapevine is uneven. But don’t aim for perfection! 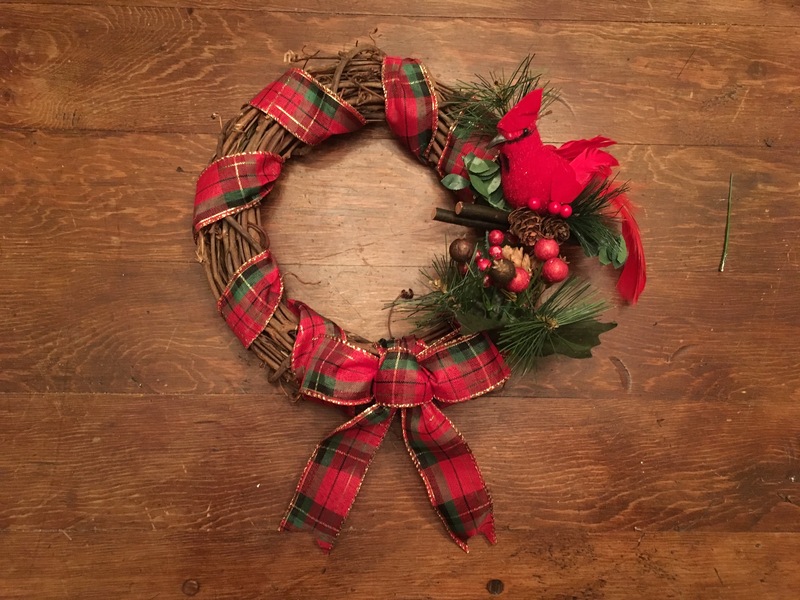 A little unevenness adds a warm, rustic touch! 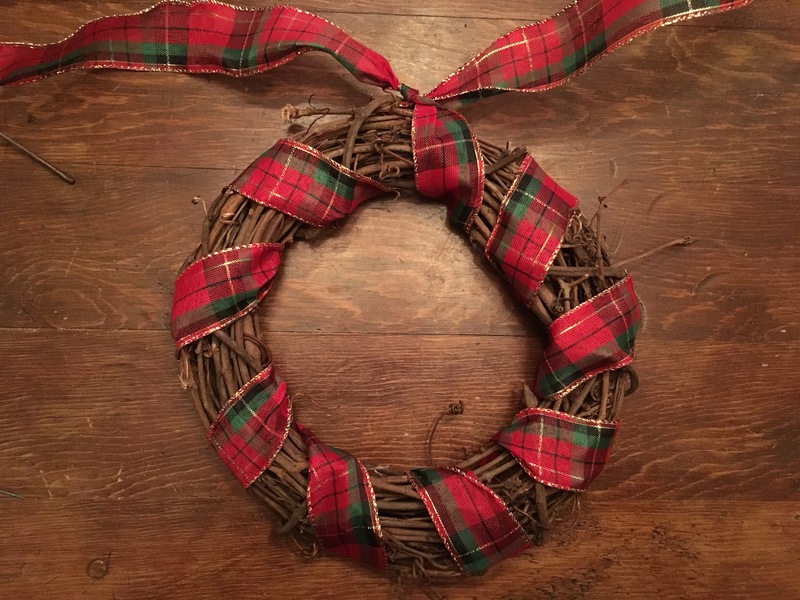 Leave a long tail at the opposite end, too, and with both tails, tie a tight double knot towards the back of the the wreath (so that it doesn’t show when hung). 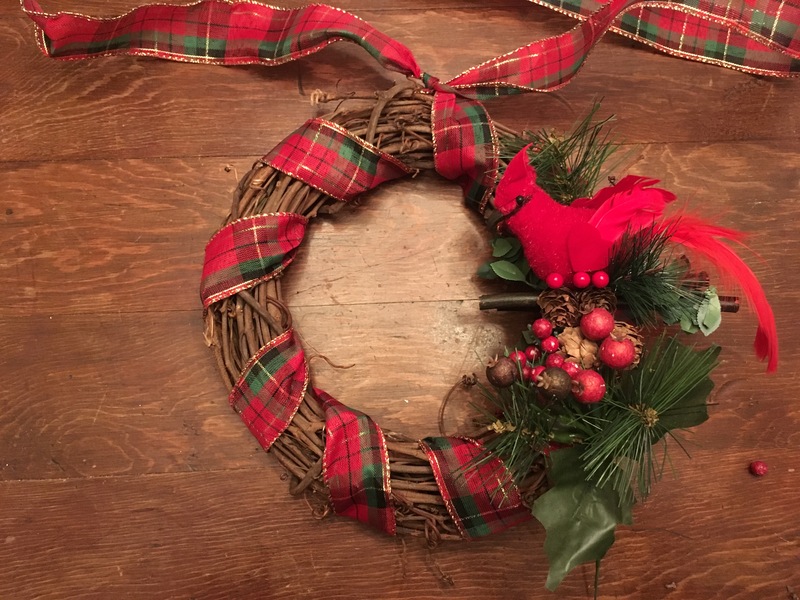 Since this wreath is only featuring accents along a quarter of it, place the eye-catching piece a little higher than the three o’clock spot, just above the center. Hint: Just place the item until you have everything in place; don’t glue it yet! I placed the berry/pine cone pick below the cardinal, but felt like it needed something more behind the bird, so I cut a small piece of pine off the pick and placed it above the cardinal’s head to add depth. Finally I cut another piece of ribbon to create a bow, and snipped the ends into shape. Once everything was in place, I used a hot glue gun to secure it all, and when it dried, removed any wayward glue strings. Next Post We’ve Launched an Etsy shop!